Dark money is flooding into the Dana Point city council election. Over $45,000 has been reported by special interest PACs in Dana Point during the last weeks leading up to the 2018 election. The top two PACs reporting in recent filings are 1) CA Real Estate PAC (CREPAC) and 2) Dana Point Taxpayers Association. In addition, there appear to be still other PACs that are either giving or receiving money from these two PACs. The net impact of the dark money flooding in from these Political Action Committees is that over 43% of all dollars at work in this election come from businesses and PACs and are supporting candidates Joe Muller (district 1), Richard Viczorek (district 2), and Jamey Federico (district 3), and opposing Joe Jaeger (district 1), Mark McGinn (district 2), and Charles Payne (district 3). Who runs and funds these PACs? What follows here is an overview of the information contained in those documents about the PACs involved, and about the candidates who stand to benefit from their support, or suffer from their opposition. This group has very little information available in the documents required by the Fair Political Practices Commission (FPPC) and posted on the City of Dana Point’s website. However, it appears to be a long-standing Political Action Committee of the California Realtors Association and has a history of supporting candidates across the state, spending nearly $3 million already in 2018 statewide. The mailing address appears to be 525 South Virgil Ave., Los Angeles, CA 90020. The CA Real Estate PAC (CREPAC) may be the largest source of funding for PACs at work in the 2018 Dana Point election. CREPAC has directly paid for several mailing campaigns, according to documents filed at the City of Dana Point, exclusively in support of Joseph Muller (district 1), Richard Viczorek (district 2), and Jamey Federico (district 3). 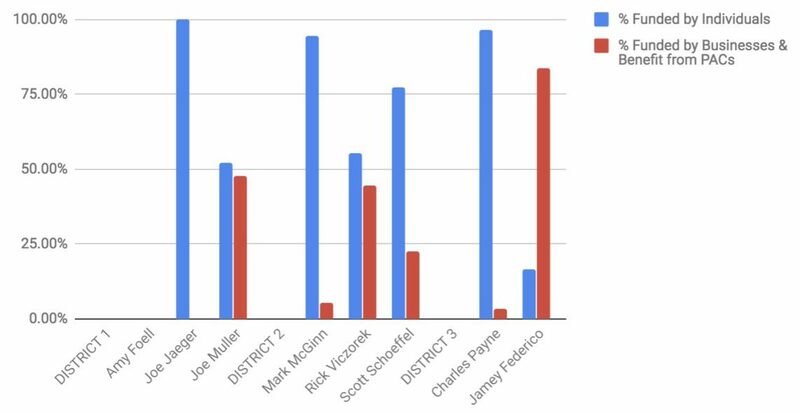 CREPAC explicitly opposes Joe Jaeger (district 1), Mark McGinn (district 2), and Charles Payne (district 3) through its large donations to another local PAC called the Dana Point Taxpayers Association in a practice that shuffles money from PAC to PAC. CREPAC’s extensive, dark-money spending has created a clear distinction between two groups of candidates, whether the candidates like it or not. 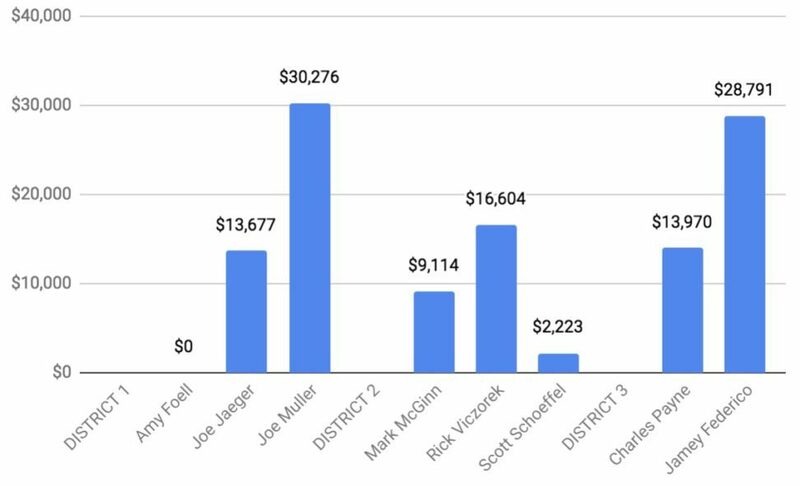 There is no evidence yet to indicate that CREPAC is investing any money to support or oppose candidates Amy Foell (district 1) or Scott Schoeffel (district 2). 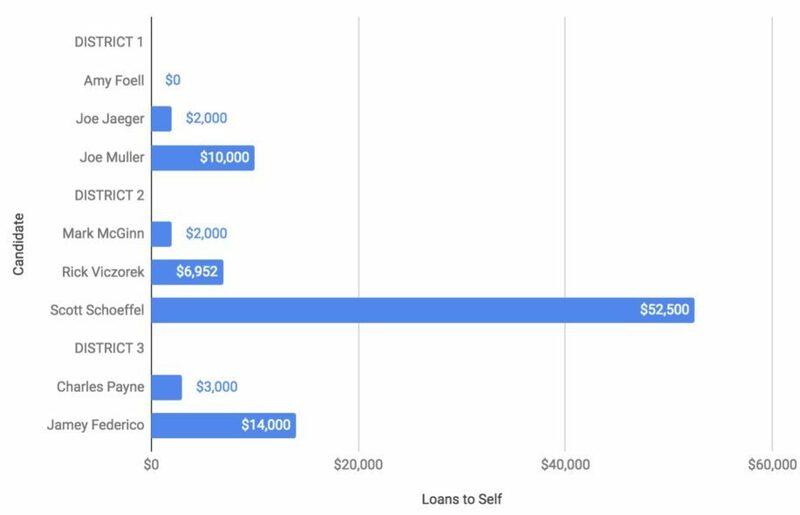 Note: $5,600 spent by PACs to oppose McGinn and Jaeger were excluded from this chart because those dollars cannot be directly attributed as supporting Viczorek or Muller. The Dana Point Taxpayers Association appears to have been active in Dana Point for several years and has held an annual gala fundraising event since at least 2016, at which the group bestows its “Hero of the Year” trophy (see below). Recipients include Bill Brough (2016), Diane Harkey (2017), and Pat Bates (2018). Individuals named in official filings for the Dana Point Taxpayers Association over the past few years are: Jen Slater, Dirissy Doan, and Michael Powers (in 2016), and the mailing address appears to be 34145 Pacific Coast Highway, Suite 701, Dana Point, CA 92629, which is the UPS Store on PCH. Please reply in the comments section at the bottom of this article if you, or someone you know, is involved with the Dana Point Taxpayers Association, FPPC #1380834. We would like to interview the members of this group for a full story. The Dana Point Taxpayers Association received at least $15,000 in donations from the CA Real Estate PAC (CREPAC) in August & September of 2018 earmarked to oppose Charles Payne. Those funds may be responsible for the appearance of the attack campaign called “Stop Slick Sanford” at https://stopslicksanford.com/. 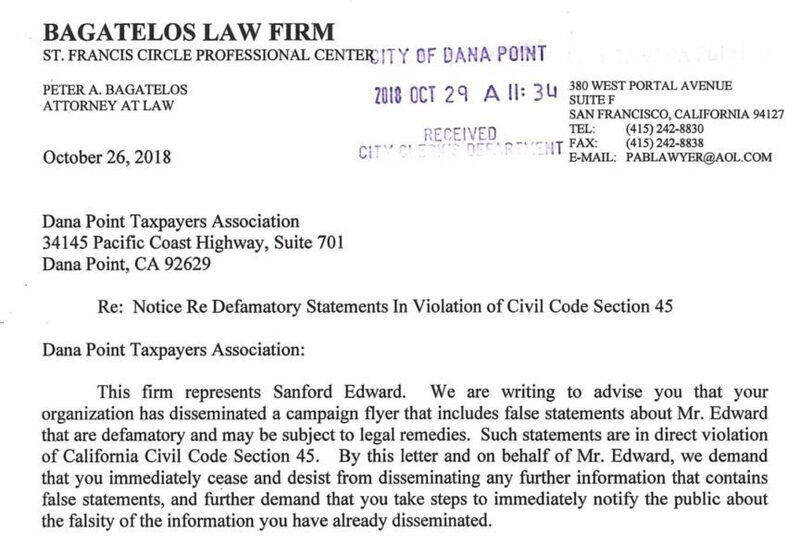 Sanford Edward’s lawyers have recently sent a cease-and-desist order to the Dana Point Taxpayers Association, alleging defamation. Click here to view that letter. 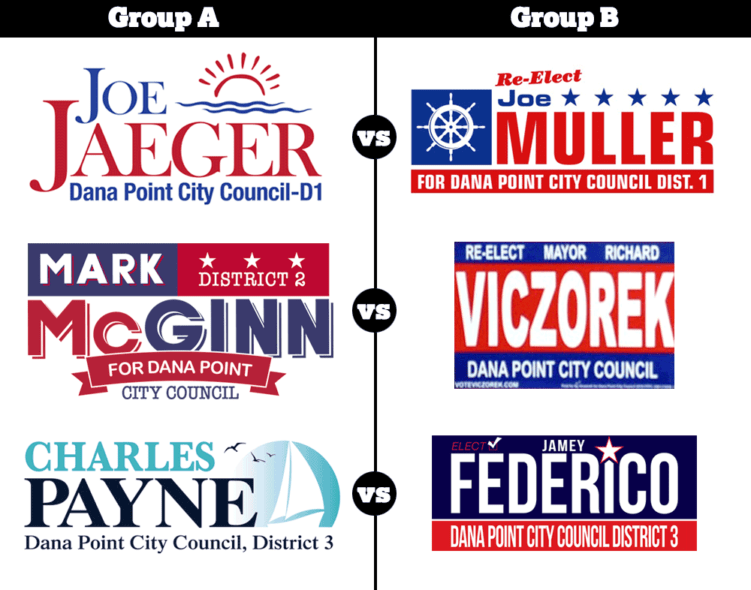 The Dana Point Taxpayers Association has been at work in Dana Point districts 1, 2 and 3 distributing negative campaign material attacking Joe Jaeger, Mark McGinn, and Charles Payne via both email and standard mailings. In a recent move, the Dana Point Taxpayers Association carelessly disclosed candidate Charles Payne’s home address in a public mailer. Conversely, the public documents containing the Dana Point Taxpayers Association address remain hidden from public view and Dana Pointers have no idea who is behind the Dana Point Taxpayers Association. Of course, PACs and candidates are not allowed to coordinate or communicate about the PAC’s efforts. This PAC’s only funder appears to be the Dana Point Taxpayers Association, which gave $5000 to the Taxpayer Protection PAC on 11 September 2018. The treasurer of the Taxpayer Protection PAC is listed as Lysa Ray, who is also the treasurer for candidates Joseph Muller, Richard Viczorek and Jamey Federico in this 2018 Dana Point election. This PAC has no recent election-related documents visible on the City of Dana Point’s website. However, the South Orange County Economic Coalition appears in at least one document as having donated $2500 to the Dana Point Taxpayers Association, and social media photos show Joseph Muller and Richard Viczorek attending an event for the South Orange County Economic Coalition at a Dana Point restaurant in May 2018.